Welcome to the Novotel Paris Gare de Lyon for your stay in the heart of Paris! Fancy a midnight dip in our pool, a morning jog in the fitness center or perhaps a taste of the delicious food at the hotel restaurant? Our team looks forward to welcoming you! For a stay in the heart of the capital, choose the Novotel Paris Gare de Lyon hotel, located close to the Bastille. Discover its fully renovated rooms and make the most of the stunning indoor pool and modern fitness center. Whether you are visiting with f amily or friends, enjoy a day of discovery and entertainment at Vincennes Zoo or Disneyland® Paris (direct access via public transport) or a concert at Bercy Arena. Six premium meeting rooms are available for your seminars. Novotel is the place for you. Our hotel has a private enclosed car park with direct elevator access. Thanks to our location right by the Gare de Lyon, you can visit the sights of Paris by metro or bus. For shopping or leisure, the department stores are 15 min away via public transport The Louvre, the Opéra and the department stores are 15 minutes by metro. 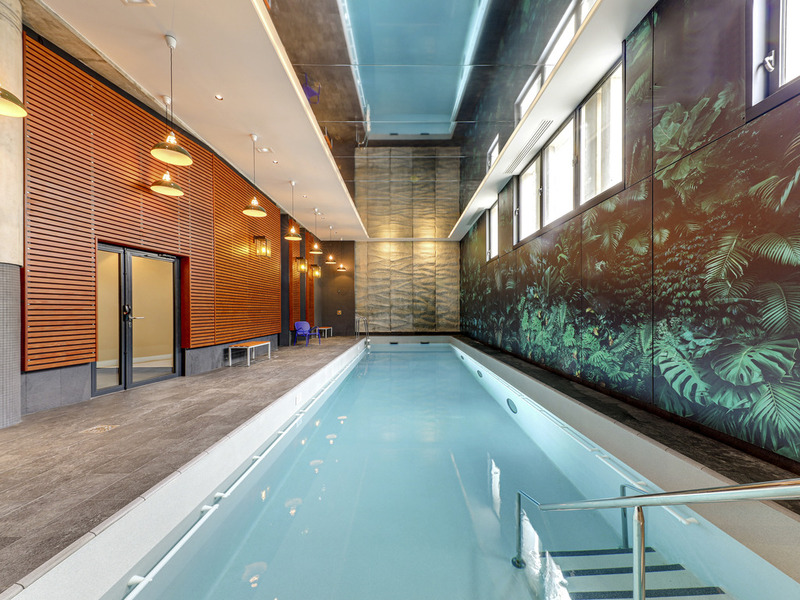 This 4-star midscale hotel offers an indoor swimming pool and fitness room. A paying car park is also available. For a stay in the heart of the capital, choose the Novotel Paris Gare de Lyon hotel! Whether visiting with family or friends, enjoy a day of discovery at Vincennes Zoo or Disneyland® Paris (direct access via public transport), or a concert at Bercy Arena. With a contemporary and completely modular design, Novotel's spacious rooms are real living spaces and can be adapted to suit all requirements. All of our rooms are fully renovated and have a queen size bed, free WIFI, air conditioning and a 42" LCD TV. For greater comfort, choose our Executive Room: with bathrobes, slippers, free minibar and Nespresso coffee. Our chef, Alexis Pinto, offers delicious and simple cuisine with a menu created from fresh products accompanied by an excellent selection of wines. Come during your vacation and enjoy our "just like home" dishes to share. For a business meeting or a drink with friends, we have everything you need to make it an enjoyable occasion. Enjoy our selection of salads, sandwiches and desserts over a glass of wine or a cocktail. Stayed here for 5 nights whilst travelling with family. The location is perfect as it is close to the metro and SNCF. There are plenty of dining options surrounding the hotel. The reception staff, Maria and Hugo, made the process short yet informative. They were personable and attentive to our needs. The room itself was spacious and comfortable. Breakfast was adequate but the flow of the buffet was very disjointed and did not work. The single pancake machine was extremely popular and was constantly running out of batter. Another machine would have helped. Betty, the breakfast manager, was fantastic and allocated tables as quickly as she could. She was friendly and always had a cheerful bonjour. She made our daily foray into the buffet line bearable. All in all, a great and comfortable stay. We will return to this hotel when next in the City of Lights. Excellent room - breakfast hall a little crowded. Overall very good. Polite staff, modern fresh design, good facilities. Really enjoyed our stay here. Nothing was too much trouble, the staff were lovely and the beds are amazing. Loved it! Nice room, good beer and breakfast! And the HIT: glass wall between the bathroom and room! We could keep an eye on our kids having fun in the bath while watching tv before bed. An hotel just a night not good for big stays. I think in todays world is still incedible to have people working in a Hotel that does not speak English. Expecially in BAR and/or customer Service/Relations/Care departments. It is really shows a NON CUSTOMER CAREDRIVE MINDSET by the Hotel adminstration. The gym is very poor. In terms of Cardio machines avaiable are actually good, but outside of that... 1 machine...and existing weigts to a proper trainning. I actually choose the hotel because of gym and i was very very disapointed. In terms of food, Healthy food is almost enexisting and a simple Fresh orange juice was most of the time not avaiable. In the pool the air is very heavy and you can not enjoy it. I finish my clinex in the room, leave it visiable for change and was never replaced with new paper. Heater is also not working very good....i had cold some days even leave it on all night. Howeever I had a very Good experience at reception and with some employees in the Restaurant. Very helpuff and willing to help. Landry service was good too. The rooms are very good and contemporaneouse ( except the carpet) and the sound block is amazing. The bed is actually the best thing in the hotel taking in consideration confort. Breakfast is also variable and you can find a several stuff, the only thing to improve is having a cook to cook you some on time fresh food. Hotel was lovely and staff helpful. Restaurant was good for breakfast but dinner was average. A fabulous hotel with a great room and lots of activities to occupy my son. Excellent welcome at reception when we checked in. Staff member was friendly and told us everything we needed to know. The room was lovely with a fantastic bathroom, huge TV and a mini bar with complimentary water and soft drinks. The swimming pool and games room were perfect additions to keep a 10 year old happy. Staff were friendly and welcoming and the room was clean with everything we needed. The selection at breakfast was excellent. Nice room ,and very good soap. Room: size/accommodation: strange for a family room for 2+2 (2 adults, 2 children), we had fewer cupboards than a room for 2+1 (our 2 befriended families, each with 1 child). Our room was also full as soon as we had set up the children's bed sofa, the remaining space was occupied with the suitcases, due to a lack of cupboard space. We had requested a room high up, with a view - 4 months in advance - and it was a bit surprising that we ended up on the 2nd floor. Since we were 3 families, and all ended up on the 2nd floor, it was fitting enough, hence we didn't request a change... Other than that, the room was fine. Oh, and thank you for thinking of my birthday. Well done, thoughtful and pleasant. Bathroom: neat, the glass with opaque effect. Not good: the hair dryer that fell down as soon someone looked at it. At least ours didn't lead to electrical shocks. After the other family had an incident (well, actually, the cleaning lady had a real incident), our children didn't dare use it... Breakfast: upon first looks, all seemed great. Then, little things start irking: the first morning, the milk from the machine was sour. That may happen, but the reaction of the staff: &quot;just use the other machine&quot; was very uncaring. It is indeed a buffet, so a certain level of self-sufficiency should be present on the side of the guests, but in quite a few cases, things were replenished only upon demand. Especially for the pancakes, that created an unnecessarily long wait at several occasions. The expectations that are created from the moment the staff welcomes and seats the guests are not answered due to the lack of care afterwards. The devil is in the details, and when the details are wrong, the impressions of grandeur and class are just not met. Please don't get me wrong, we did have a good time. From the available facilities and organisation, one could have had higher fulfillment of expectations. Another example: it was nice to be able to have a swim in the pool, but looking at the details, lots was off: the shower on the men's side had no door, the lock on the shower/toilet was dysfunctional, the walls looked ready for a new coat of paint. So for picky acquaintances, we'd not likely recommend the Novotel, and for not-so-picky acquaintances, they might get well served at a lower price elsewhere. The essentials were all in place even if the décor of the room was rather odd. How many people really want opaque glass between shower and bedroom? The reception staff were charming and helpful and the chambermaids cheerful and friendly. Great stay and convent to subway and trains! Great central hotel with all the amenities I need, good value. Good size room that's super clean, great breakfast. Having a pool/fitness was a great bonus. Located next to Paris Gare De Lyon TGV station. Very convenient to go round Paris with Metro servicev from the train station. Room is clean and well maintained. Breakfast good. The only downside is that with the amount paid, disposal sippers are only available for Executive Room. However, the receptionist was kind enough to making arrangement to send slippers to my room.